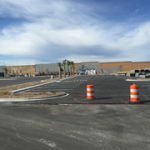 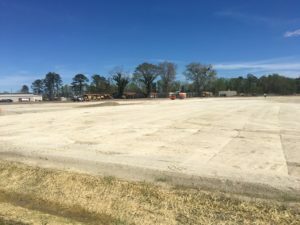 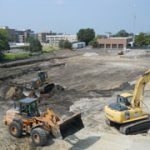 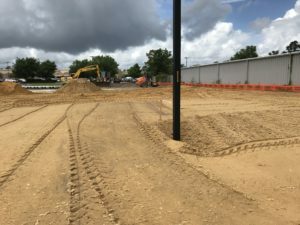 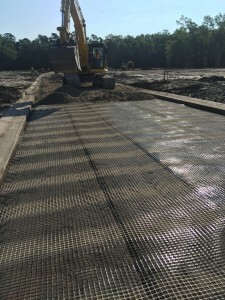 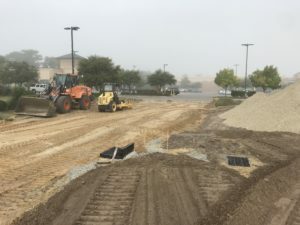 Our work on this project consisted of, stripping site, cut/fill excavation, grading, storm drain installation including an R tank system, curb & gutter and asphalt paving. 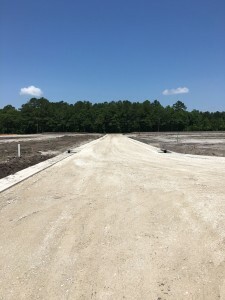 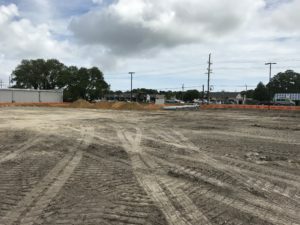 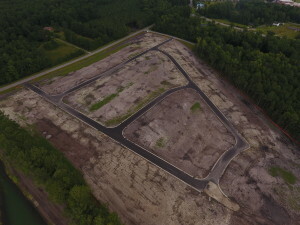 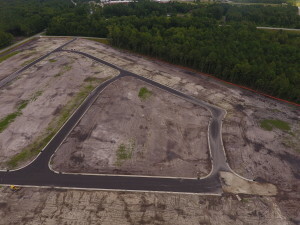 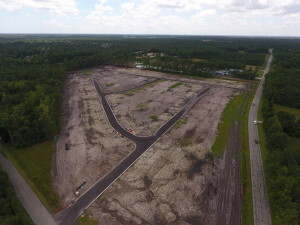 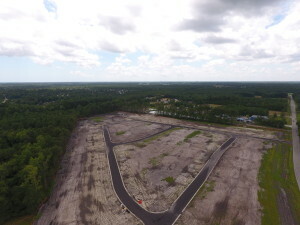 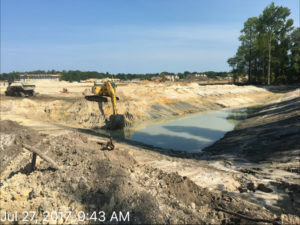 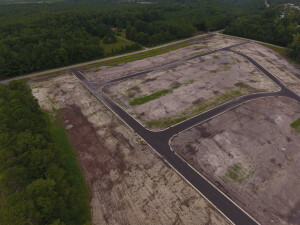 This phase was a Complete Site Development from 7 acres of clearing and grubbing, grading and excavating, digging ponds, installing underground drainage system, water and sanitary sewer installation, curb & gutter, sidewalks and asphalt paving. 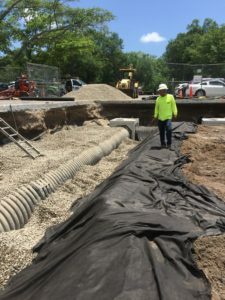 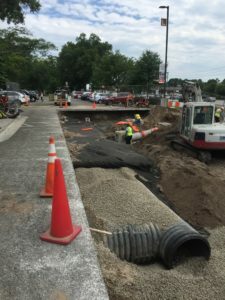 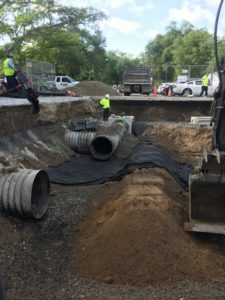 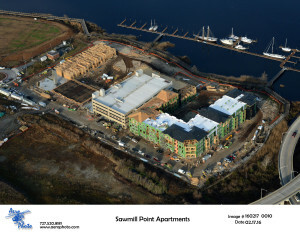 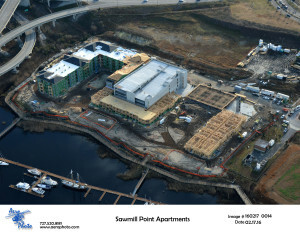 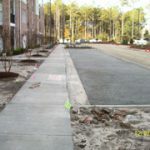 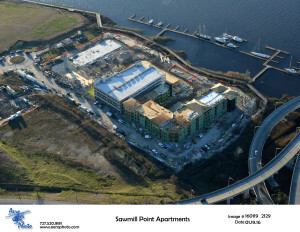 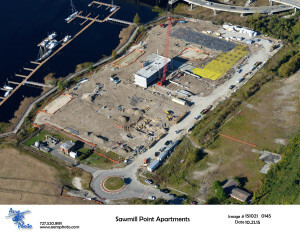 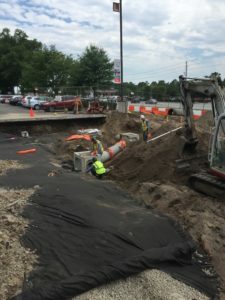 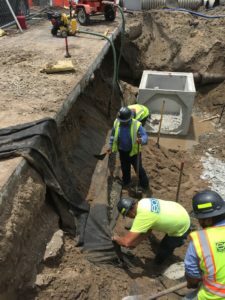 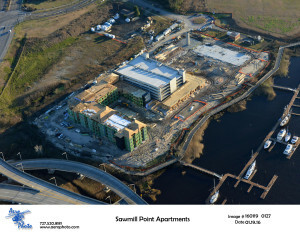 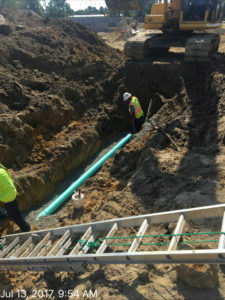 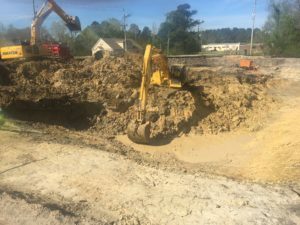 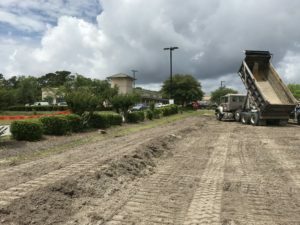 This project is an existing apartment complex where we installed new sanitary sewer lines, repaired existing leaking storm drains, performed all erosion control, traffic control, demolition of existing storm drains, curb & gutter and asphalt. 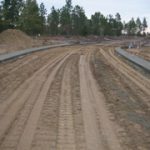 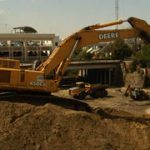 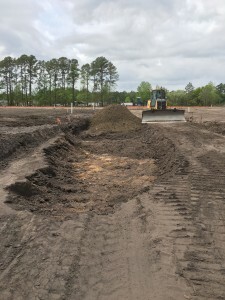 Construction site development, water and sewer installation, underground drainage system, land excavation and grading, building pad, erosion control, demolition, paving, curb & gutter and sidewalks. 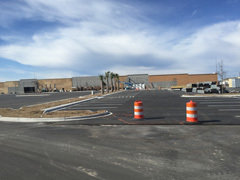 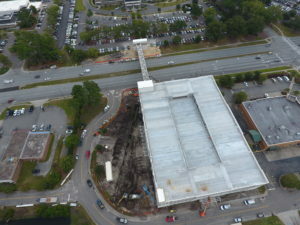 This project is a complete site development for a Harris Teeter Shopping Center. 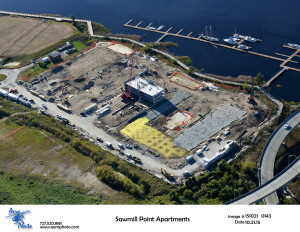 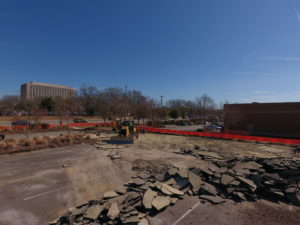 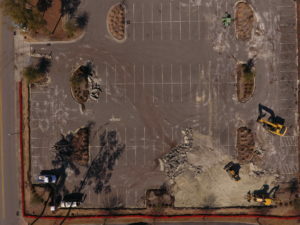 Demolition of existing buildings, asphalt and concrete curb & gutter. 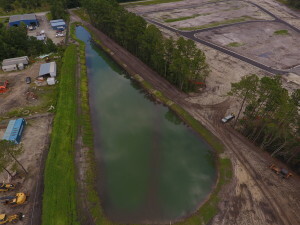 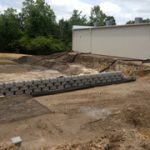 Abandon existing utilities, site clearing and grubbing, all erosion control, dug detention ponds, install modular block retaining walls, installed the storm drain, water and sewer infrastructure, curb & gutter and paving. 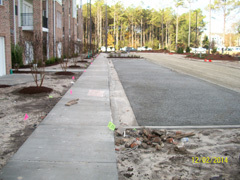 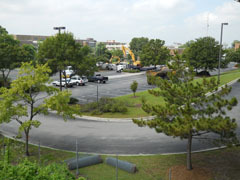 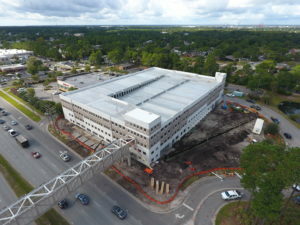 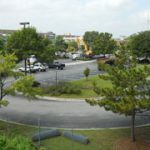 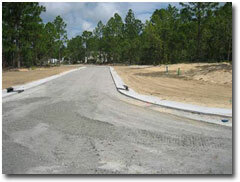 Our scope of work on this project consisted of demolition of existing parking lot asphalt and curb and gutter. 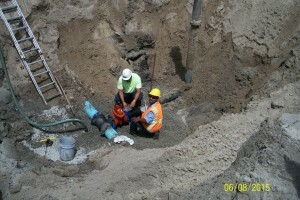 Installing new storm drain, water and sewer infrastructure. 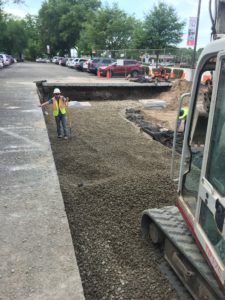 Installing new curb and gutter and asphalt. 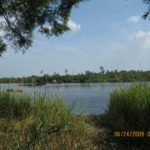 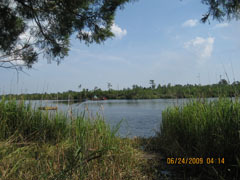 Jefferson Landing, now known as Brunswick Forest located in Leland in Brunswick County. 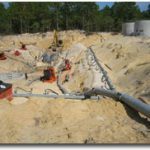 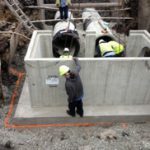 Our work included water and sewer installation with over 12,000 lf of sewer installed in depths at times greater than 20’. 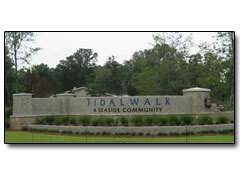 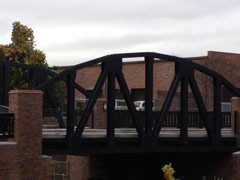 Tidal Walk is located on Myrtle Grove Rd. 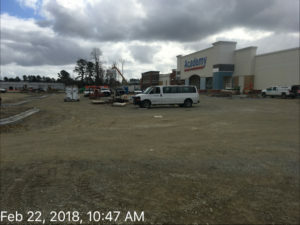 in New Hanover County. 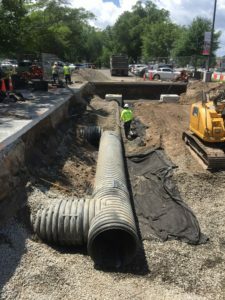 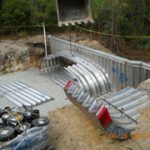 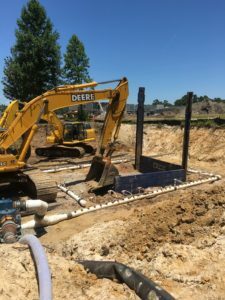 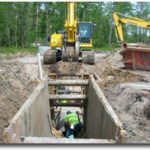 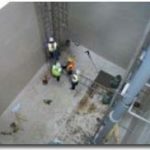 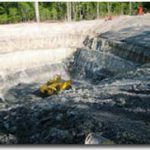 Our work included water, sewer and storm drain installation with over 9,000 lf of gravity sewer installed in depths at times greater than 20’ and over 8,700 lf of force main sewer. 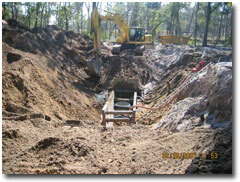 Jack and Bore and Directional Bore methods were used in some of the installations. 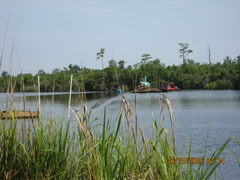 Woodlake @ Lord’s Creek is located off of River Road in New Hanover County. 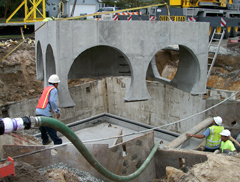 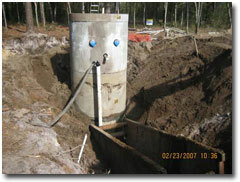 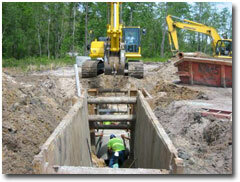 Our work there consisted of complete site development, water, sewer and storm drain installations. 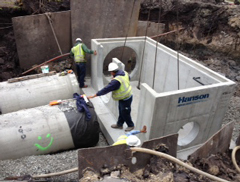 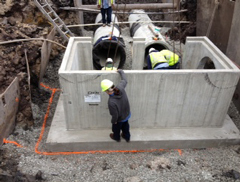 We installed more than 11,000 lf of gravity sewer at times in depths greater than 30’. 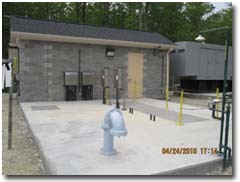 North Campus Regional Lift Station is located in New Hanover County. 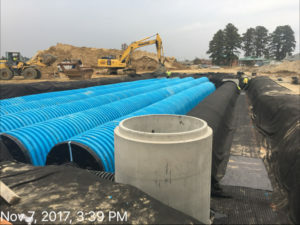 This project is the construction of 990 LF of 10 inch gravity sewer, 3,250 LF of 12 inch gravity sewer, 1,305 LF of 14 inch gravity sewer, 980 LF of 24” gravity sewer, 1,550 LF of parallel 12 inch and 18 inch force mains, a 728 GPM pumping station with 20’ x 25’ Cast In Place Wet Well, Electrical building, all weather access road, site work and SCADA system installation and integration. 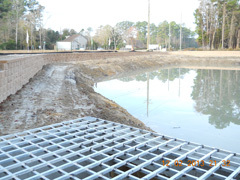 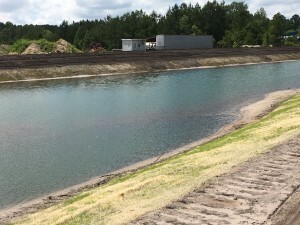 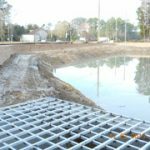 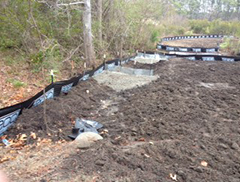 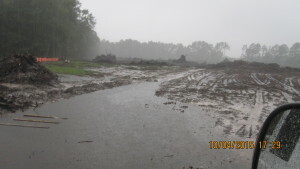 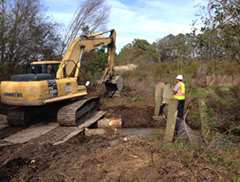 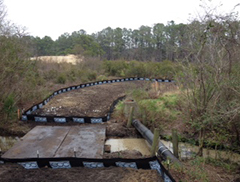 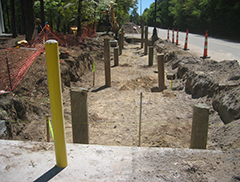 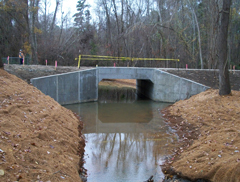 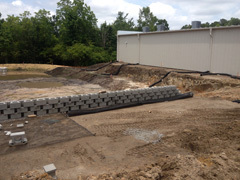 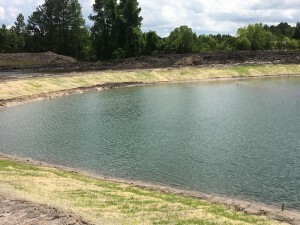 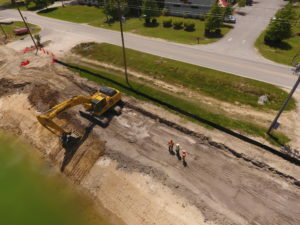 Parkwood Area Storm Water Improvements located in Jacksonville, NC. 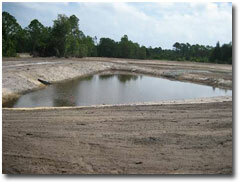 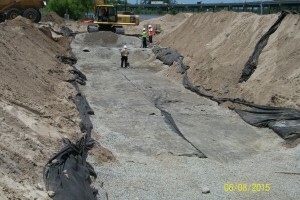 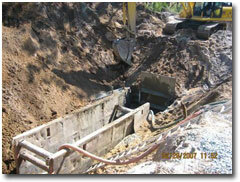 This project was to replace the storm water system. 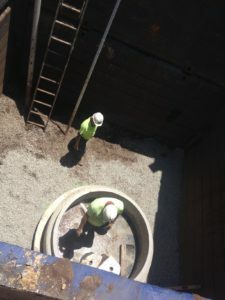 Work includes adjustments to water 6″-8″ DIP 475 LF and sewer utilities 8″ DIP 4,600 LF, 12″-18″ DIP 494 LF, 93 MH’S, installing RCP piping ranging in size between 18″-48″ in diameter 9,162 LF and installing concrete box culverts sized 5’x2′. 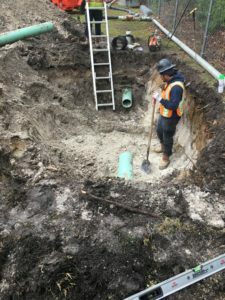 Included are all manholes, connections to existing piping, repaving streets, reconstructing curb & gutter, sidewalk and driveways, demolition, abandonment of pipelines and all other work required to complete the work. 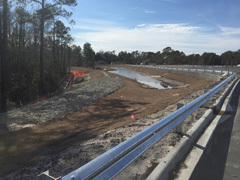 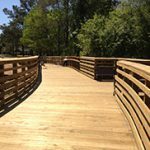 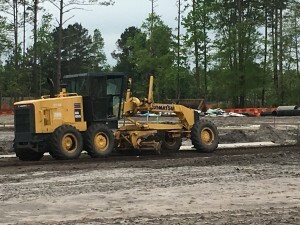 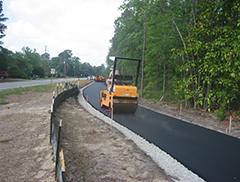 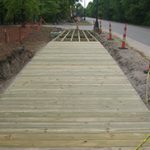 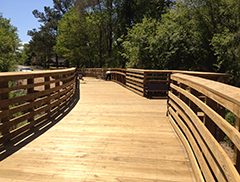 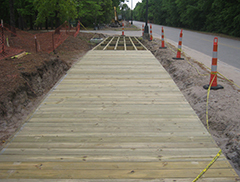 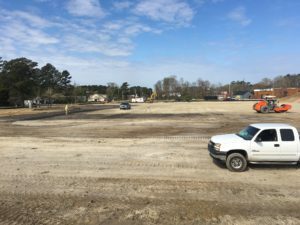 Construction of a multi-use trail from Randall Parkway to Mallard Dr. includes sidewalks and bicycle lanes for the City of Wilmington in coordination with UNCW and NCDOT. 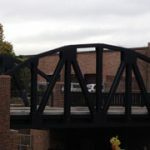 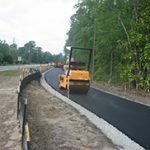 Work includes asphalt paving, concrete, erosion control, hauling, excavating, grading, pavement markings, traffic control, storm drain, signage, fencing, utilities, landscaping and irrigation. 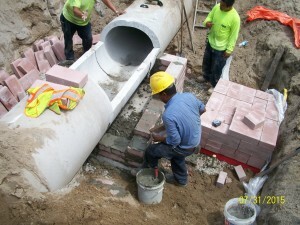 Includes 12″-24″ RCP Storm drain. 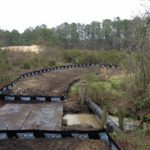 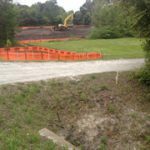 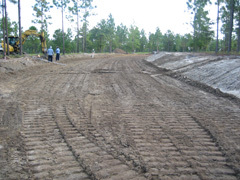 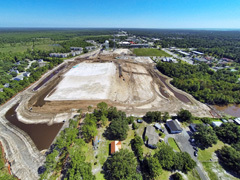 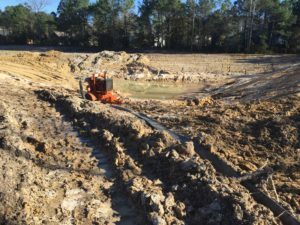 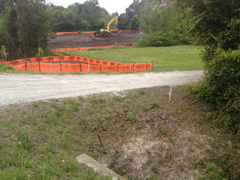 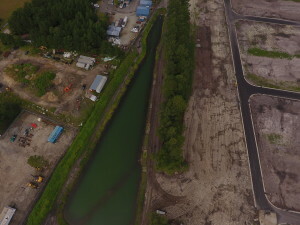 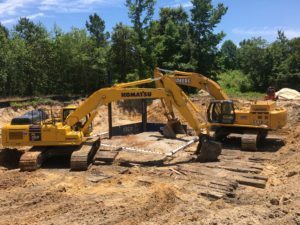 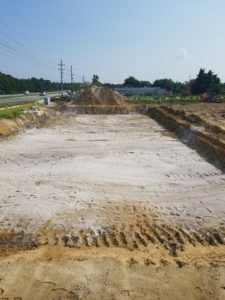 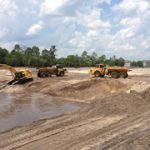 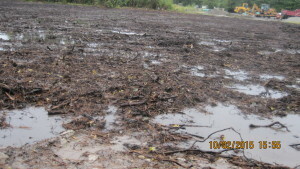 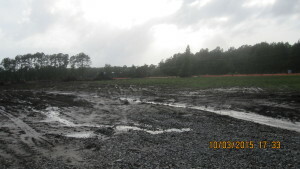 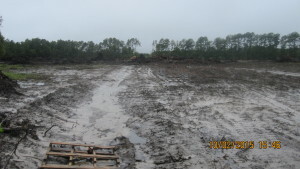 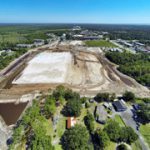 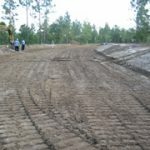 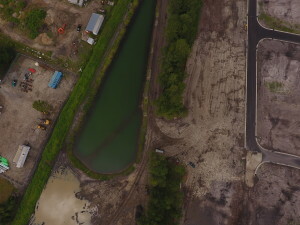 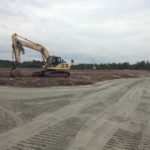 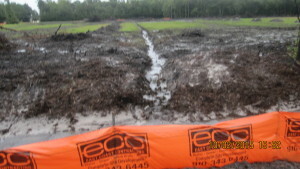 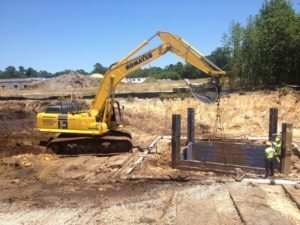 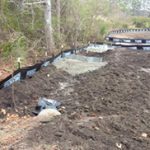 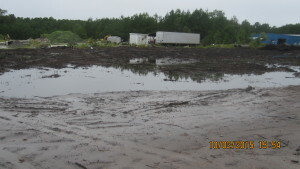 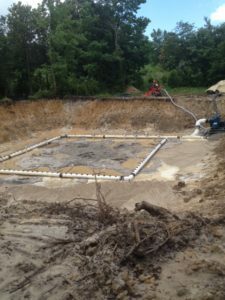 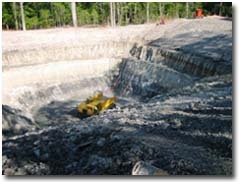 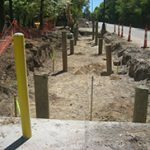 Complete site work package including, earthwork, erosion control, site demolition including tree, concrete asphalt, water, sewer and storm drain removal. 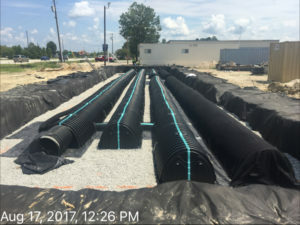 Replacement and installation of drainage system with piping from 12″ – 60″, roof drain piping, temporary sediment basins, sewer and water. 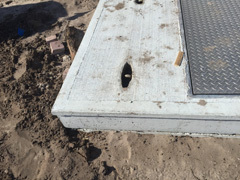 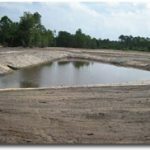 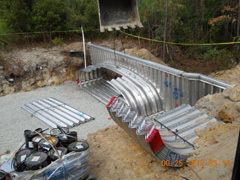 60″ RCP STORM DRAIN 376 LF, 12″-36″ RCP STORM DRAIN 576LF, 4″-8″ CPP 1,580 LF, Construction of vehicular bridge. 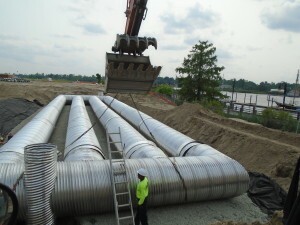 Installation of approx. 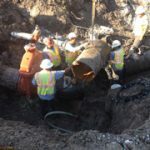 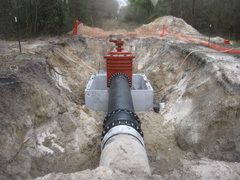 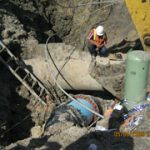 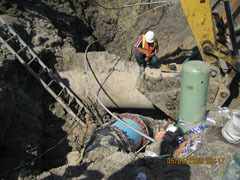 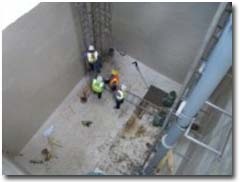 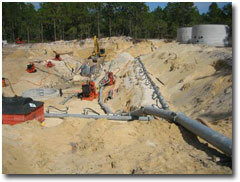 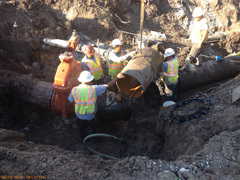 80,000 ft. of 24″ – 6″ water supply transmission mains, potable watermains and concentrate lines. 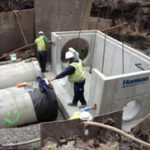 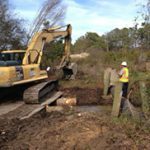 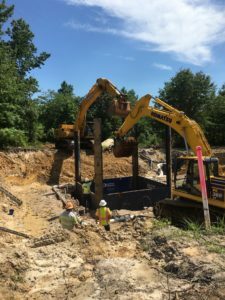 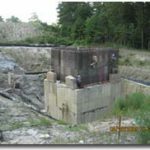 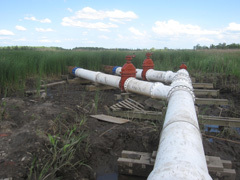 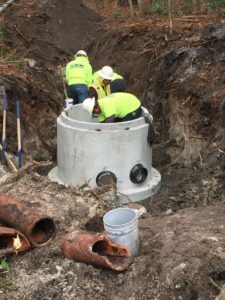 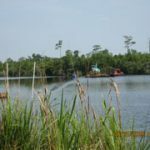 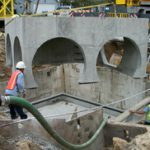 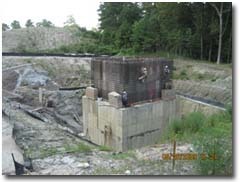 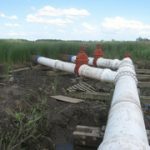 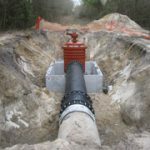 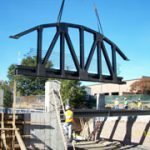 30″ – 18″ Jack and Bores, 8″ – 6″ Horizontal Directional Drills, installation of an outfall diffuser structure with directional drill under a lagoon and creek into the New River. 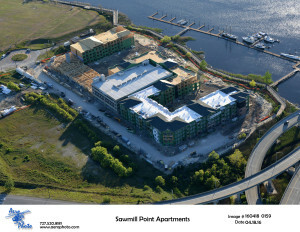 Complete with all appurtenances and all associated site work. 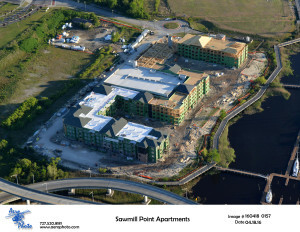 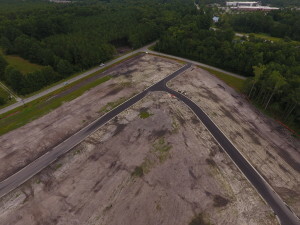 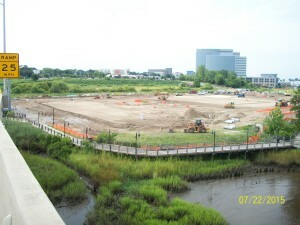 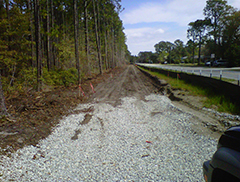 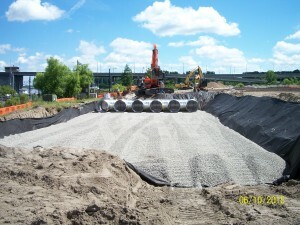 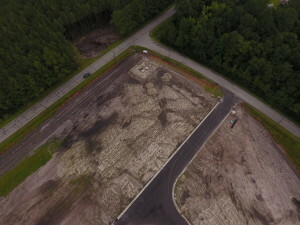 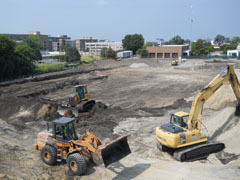 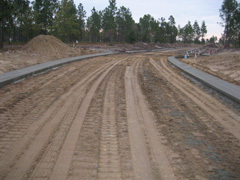 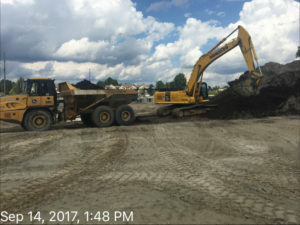 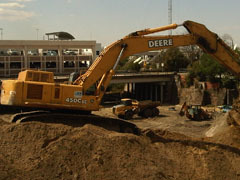 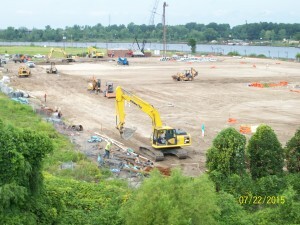 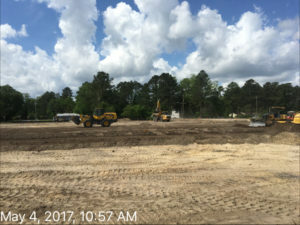 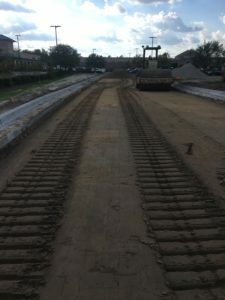 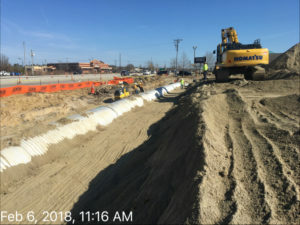 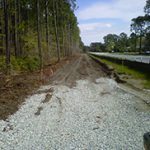 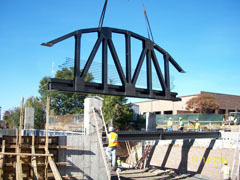 Our work on this project consists of demolition, clearing, removal of demo material, tree protection, traffic control, intersection improvements, erosion control, temporary seeding, construction entrance, all excavation, grading, cut/fill, import/export, fine grading, topsoil spreading, including curb backfill, all compacted subgrade, all asphalt work including drive aprons and intersection improvements, complete segmental block retaining wall including all backfilling, complete storm drainage system including all storm structures, piping, pipe bedding, fittings and connections, storm water wetlands, roof drain piping and connections, rip rap, complete water and sewer installation. 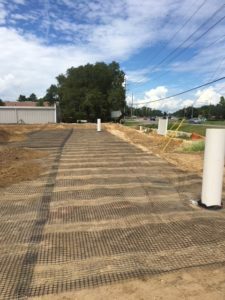 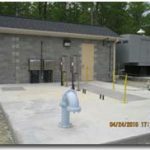 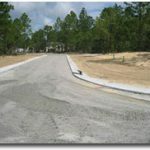 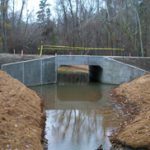 Our work on this project included water, sewer, storm drain, concrete, keystone retaining walls, jack and bore, all earthwork operations and asphalt and pervious concrete paving, concrete sidewalks and curb and gutters. 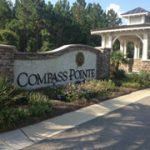 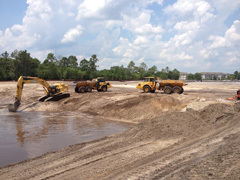 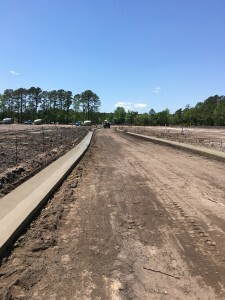 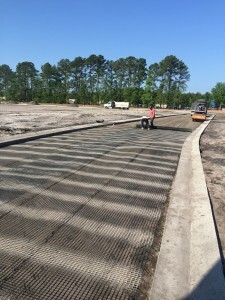 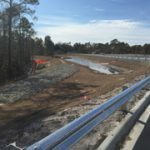 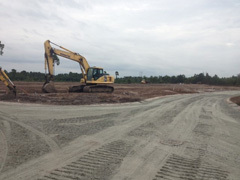 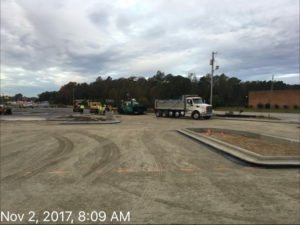 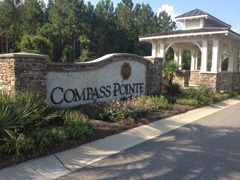 Throughout Compass Pointe’s different phases our work consists of Grading, Storm Drain and Structures, Water, Sewer, including a lift station, Irrigation, Conduits, placing stone, installing curb and gutter, sidewalks and asphalt including the turn lane on the west entrance. 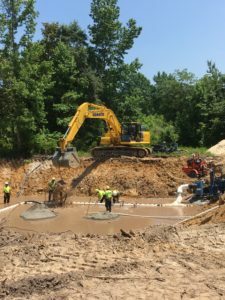 This project included the replacement or abandonment of 24 air release valves, isolation gate valves, vacuum relief valves, blowoff gate valves and misc. 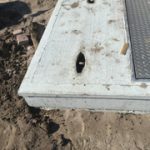 door repair or replacement for below grade structures. 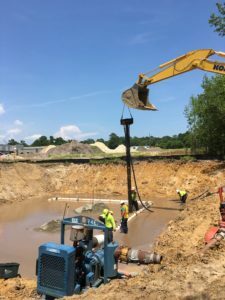 Replacement of flowmeter and surge relief valve at pump station, demo abandoned pump station and existing raw water piping and install new raw water piping and supports.